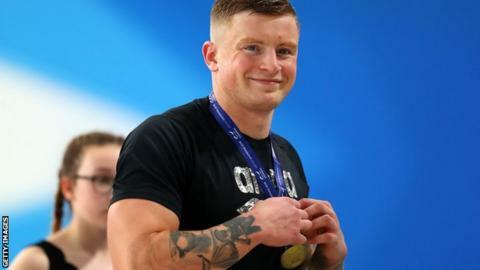 Adam Peaty won the 100m breaststroke at the British Championships in Glasgow to seal his place on the British team for this year’s World Championships. The Olympic champion eased to victory in 57.87 seconds, with Commonwealth gold medallist James Wilby second. “I’m back to world number one and that’s job done for me,” Peaty said. Aimee Willmott’s 400m individual medley victory should be enough for her to qualify for July’s World Championships in Gwangju, South Korea. The English Commonwealth champion claimed victory in four minutes 36.98 seconds. Abbey Wood finished second with European bronze medallist Hannah Miley likely to miss out on the Worlds after finishing third. Three-time Olympian Miley had ankle surgery before Christmas and told BBC Sport she was happy just to be back racing. Rising star Freya Anderson edged out Holly Hibbot by just 0.01 seconds to claim victory in the 200m freestyle final, with her main event – 100m freestyle – to come on Friday. There was also an impressive win for Welsh 1500m distance swimmer Daniel Jervis in the shorter 400m freestyle competition. “I’m really happy with that as it’s not my main event,” he told BBC Sport. Commonwealth gold medallist Sarah Vasey won the 50m breaststroke title, with Thomas Howdle claiming the men’s 50m backstroke title. However, both will need to perform well in their respective 100m events to be considered for the Worlds team. Peaty is set to to compete in the 50m breaststroke on Wednesday.